The readings for this Sunday focus on humility and service to those who have no ability to repay. Our first reading is from the Book of Sirach (3:17-28, 20, 28-29). Sirach is a book of wisdom, maxims and moral teachings. No doubt, Jesus would have been schooled in its teachings as a young boy. "My child, conduct your affairs with humility, and you will be loved more than a giver of gifts. Humble yourself the more, the greater you are, and you will find favor with God. What is too sublime for you, seek not, into things beyond your strength search not. The mind of a sage appreciates proverbs, and an attentive ear is the joy of the wise. Water quenches a flaming fire, and alms atone for sins." Our Gospel reading (Luke 14:1, 7-14) is a parable on humility and service. 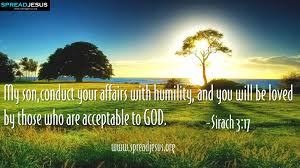 Jesus could very well have been thinking of Sirach's lesson on humility when he told it. "On a sabbath Jesus went to dine at the home of one of the leading Pharisees, and the people there were observing him carefully. He told a parable to those who had been invited, noticing how they were choosing the places of honor at the table. 'When you are invited by someone to a wedding banquet, do not recline at table in the place of honor. A more distinguished guest than you may have been invited by him, and the host who invited both of you may approach you and say, 'Give your place to this man,' and then you would proceed with embarrassment to take the lowest place. "Rather, when you are invited, go and take the lowest place so that when the host comes to you he may say, 'My friend, move up to a higher position.' Then you will enjoy the esteem of your companions at the table. For every one who exalts himself will be humbled, but the one who humbles himself will be exalted.' Then he said to the host who invited him, 'When you hold a lunch or a dinner, do not invite your friends or your brothers or your relatives or your wealthy neighbors, in case they may invite you back and you have repayment. Rather, when you hold a banquet, invite the poor, the crippled, the lame, the blind; blessed indeed will you be because of their inability to repay you. For you will be repaid at the resurrection of the righteous.'" Our Epistle reading (Hebrews:12:18-19, 22-24) is a lesson in contrast between the Old Covenant. based on the fear of God and the New Covenant, based on the love of God, with Jesus as our mediator. "Brothers and sisters: You have not approached that which could be touched and a blazing fire and gloomy darkness and storm and a trumpet blast and a voice speaking words such that those who heard begged that no message be further addressed to them. "No, you have approached Mount Zion and the city of the living God, the heavenly Jerusalem, and countless angels in festal gathering, and the assembly of the firstborn enrolled in heaven, and God the judge of all, and the spirits of the just made perfect, and Jesus, the mediator of a new covenant, and the sprinkled blood that speaks more eloquently than that of Abel." The opposite of pride is humility. It is a state Jesus calls us to. It is in humility that we may find Jesus.